ocean university of china warmly welcome international students to study English taught accounting, tourism management in china. 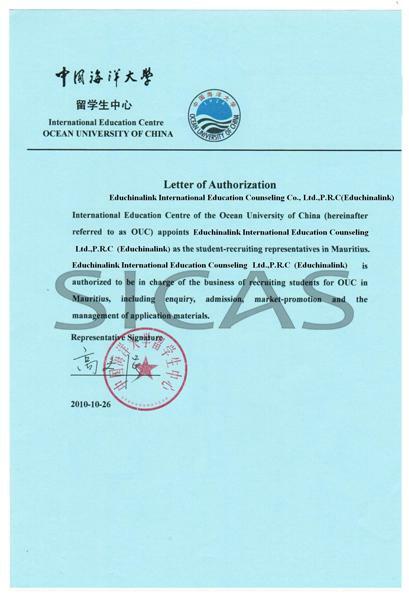 SICAS(Study In China Admission System) helps international students apply for ocean university of china and get the enrollment quickly and efficiently. Ocean University of China is a comprehensive university under the direct jurisdiction of the State Ministry of Education, offering a vast range of programs to international students, including the tailor-made English-taught prgram Master of International Business(MIB). Many world-famous universities, such as the University of Cambridge of the U.K. and the University of Western Australia, have chosen OUC to conduct tailor-made courses for their undergraduate students. Each year there are more than 1000 international students from over 30 countries pursuing their Certificate or Diploma in OUC. It is an ideal place for you to study Chinese since its Chinese language course aiming at HSK is among the first-rank in China. OUC will offer sincere service, high quality teaching and human-based management to help you realize your dream!